This article is about the conglomerate. For the publicly traded consumer electronics subsidiary, see Samsung Electronics. Not to be confused with Samsun, Samson, Sanson, Sampson, or Sanxing. Samsung (Hangul: 삼성; Hanja: 三星; Korean pronunciation: [samsʌŋ]; means "tristar" in English) is a South Korean multinational conglomerate headquartered in Samsung Town, Seoul. It comprises numerous affiliated businesses, most of them united under the Samsung brand, and is the largest South Korean chaebol (business conglomerate). 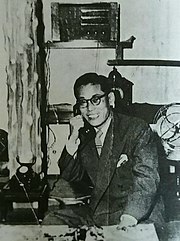 Samsung was founded by Lee Byung-chul in 1938 as a trading company. Over the next three decades, the group diversified into areas including food processing, textiles, insurance, securities, and retail. Samsung entered the electronics industry in the late 1960s and the construction and shipbuilding industries in the mid-1970s; these areas would drive its subsequent growth. Following Lee's death in 1987, Samsung was separated into four business groups – Samsung Group, Shinsegae Group, CJ Group and Hansol Group. Since 1990, Samsung has increasingly globalised its activities and electronics; in particular, its mobile phones and semiconductors have become its most important source of income. As of 2017, Samsung has the 6th highest global brand value. Notable Samsung industrial affiliates include Samsung Electronics (the world's largest information technology company, consumer electronics maker and chipmaker measured by 2017 revenues), Samsung Heavy Industries (the world's 2nd largest shipbuilder measured by 2010 revenues), and Samsung Engineering and Samsung C&T (respectively the world's 13th and 36th largest construction companies). Other notable subsidiaries include Samsung Life Insurance (the world's 14th largest life insurance company), Samsung Everland (operator of Everland Resort, the oldest theme park in South Korea) and Cheil Worldwide (the world's 15th largest advertising agency measured by 2012 revenues). Samsung has a powerful influence on South Korea's economic development, politics, media and culture and has been a major driving force behind the "Miracle on the Han River". Its affiliate companies produce around a fifth of South Korea's total exports. Samsung's revenue was equal to 17% of South Korea's $1,082 billion GDP. According to Samsung's founder, the meaning of the Korean hanja word Samsung (三星) is "tri-star" or "three stars". The word "three" represents something "big, numerous and powerful". In 1938, Lee Byung-chul (1910–1987) of a large landowning family in the Uiryeong county moved to nearby Daegu city and founded Samsung Sanghoe (삼성상회, 三星商會). 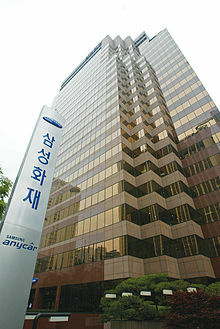 Samsung started out as a small trading company with forty employees located in Su-dong (now Ingyo-dong). It dealt in dried-fish, locally-grown groceries and noodles. The company prospered and Lee moved its head office to Seoul in 1947. When the Korean War broke out, he was forced to leave Seoul. He started a sugar refinery in Busan named Cheil Jedang. In 1954, Lee founded Cheil Mojik and built the plant in Chimsan-dong, Daegu. It was the largest woollen mill ever in the country. Samsung diversified into many different areas. Lee sought to establish Samsung as leader in a wide range of industries. Samsung moved into lines of business such as insurance, securities and retail. In 1947, Cho Hong-jai, the Hyosung group's founder, jointly invested in a new company called Samsung Mulsan Gongsa, or the Samsung Trading Corporation, with the Samsung's founder Lee Byung-chull. The trading firm grew to become the present-day Samsung C&T Corporation. After a few years, Cho and Lee separated due to differences in management style. Cho wanted a 30 equity share. Samsung Group was separated into Samsung Group and Hyosung Group, Hankook Tire and other businesses. In the late 1960s, Samsung Group entered the electronics industry. It formed several electronics-related divisions, such as Samsung Electronics Devices, Samsung Electro-Mechanics, Samsung Corning and Samsung Semiconductor & Telecommunications, and made the facility in Suwon. Its first product was a black-and-white television set. In 1980, Samsung acquired the Gumi-based Hanguk Jeonja Tongsin and entered telecommunications hardware. Its early products were switchboards. The facility was developed into the telephone and fax manufacturing systems and became the center of Samsung's mobile phone manufacturing. They have produced over 800 million mobile phones to date. The company grouped them together under Samsung Electronics in the 1980s. After Lee, the founder's death in 1987, Samsung Group was separated into four business groups—Samsung Group, Shinsegae Group, CJ Group and the Hansol Group. Shinsegae (discount store, department store) was originally part of Samsung Group, separated in the 1990s from the Samsung Group along with CJ Group (Food/Chemicals/Entertainment/logistics), and the Hansol Group (Paper/Telecom). Today these separated groups are independent and they are not part of or connected to the Samsung Group. One Hansol Group representative said, "Only people ignorant of the laws governing the business world could believe something so absurd", adding, "When Hansol separated from the Samsung Group in 1991, it severed all payment guarantees and share-holding ties with Samsung affiliates." One Hansol Group source asserted, "Hansol, Shinsegae, and CJ have been under independent management since their respective separations from the Samsung Group". One Shinsegae department store executive director said, "Shinsegae has no payment guarantees associated with the Samsung Group". In 1980s, Samsung Electronics began to invest heavily in research and development, investments that were pivotal in pushing the company to the forefront of the global electronics industry. In 1982, it built a television assembly plant in Portugal; in 1984, a plant in New York; in 1985, a plant in Tokyo; in 1987, a facility in England; and another facility in Austin, Texas, in 1996. As of 2012, Samsung has invested more than US$13,000,000,000 in the Austin facility, which operates under the name Samsung Austin Semiconductor. This makes the Austin location the largest foreign investment in Texas and one of the largest single foreign investments in the United States. Samsung started to rise as an international corporation in the 1990s. Samsung's construction branch was awarded contracts to build one of the two Petronas Towers in Malaysia, Taipei 101 in Taiwan and the Burj Khalifa in United Arab Emirates. In 1993, Lee Kun-hee sold off ten of Samsung Group's subsidiaries, downsized the company, and merged other operations to concentrate on three industries: electronics, engineering and chemicals. In 1996, the Samsung Group reacquired the Sungkyunkwan University foundation. Samsung became the world's largest producer of memory chips in 1992 and is the world's second-largest chipmaker after Intel (see Worldwide Top 20 Semiconductor Market Share Ranking Year by Year). In 1995, it created its first liquid-crystal display screen. Ten years later, Samsung grew to be the world's largest manufacturer of liquid-crystal display panels. Sony, which had not invested in large-size TFT-LCDs, contacted Samsung to cooperate, and, in 2006, S-LCD was established as a joint venture between Samsung and Sony in order to provide a stable supply of LCD panels for both manufacturers. S-LCD was owned by Samsung (50% plus one share) and Sony (50% minus one share) and operates its factories and facilities in Tangjung, South Korea. As of 26 December 2011, it was announced that Samsung had acquired the stake of Sony in this joint venture. Compared to other major Korean companies, Samsung survived the 1997 Asian financial crisis relatively unharmed. However, Samsung Motor was sold to Renault at a significant loss. As of 2010[update], Renault Samsung is 80.1 percent owned by Renault and 19.9 percent owned by Samsung. Additionally, Samsung manufactured a range of aircraft from the 1980s to 1990s. The company was founded in 1999 as Korea Aerospace Industries (KAI), the result of a merger between then three domestic major aerospace divisions of Samsung Aerospace, Daewoo Heavy Industries and Hyundai Space and Aircraft Company. However, Samsung still manufactures aircraft engines and gas turbines. In 2010, Samsung announced a ten-year growth strategy centered around five businesses. One of these businesses was to be focused on biopharmaceuticals, to which has committed ₩2,100,000,000,000. In first quarter of 2012, Samsung Electronics became the world's largest mobile phone maker by unit sales, overtaking Nokia, which had been the market leader since 1998. On 24 August 2012, nine American jurors ruled that Samsung Electronics had to pay Apple $1.05 billion in damages for violating six of its patents on smartphone technology. The award was still less than the $2.5 billion requested by Apple. The decision also ruled that Apple did not violate five Samsung patents cited in the case. Samsung decried the decision saying that the move could harm innovation in the sector. It also followed a South Korean ruling stating that both companies were guilty of infringing on each other's intellectual property. In first trading after the ruling, Samsung shares on the Kospi index fell 7.7%, the largest fall since 24 October 2008, to 1,177,000 Korean won. Apple then sought to ban the sales of eight Samsung phones (Galaxy S 4G, Galaxy S2 AT&T, Galaxy S2 Skyrocket, Galaxy S2 T-Mobile, Galaxy S2 Epic 4G, Galaxy S Showcase, Droid Charge and Galaxy Prevail) in the United States which has been denied by the court. In 2015, Samsung has been granted more U.S. patents than any other company - including IBM, Google, Sony, Microsoft and Apple. The company received 7,679 utility patents through 11 December. On 2 August 2016, Samsung Electronics unveiled the Galaxy Note7 smartphone, which went on sale on 19 August 2016. However, in early September 2016, Samsung suspended sales of the phone and announced an informal recall. This occurred after some units of the phones had batteries with a defect that caused them to produce excessive heat, leading to fires and explosions. Samsung replaced the recalled units of the phones with a new version; however, it was later discovered that the new version of the Galaxy Note 7 also had the battery defect. Samsung recalled all Galaxy Note7 smartphones worldwide on 10 October 2016, and permanently ended production of the phone the following day. Samsung Techwin acquired German camera-maker Rollei in 1995. Samsung (Rollei) used its optic expertise on the crystals of a new line of 100% Swiss-made watches, designed by a team of watchmakers at Nouvelle Piquerez S.A. in Bassequort, Switzerland. Rolex's decision to fight Rollei on every front stemmed from the close resemblance between the two names and fears that its sales would suffer as a consequence. In the face of such a threat, the Geneva firm decided to confront. This was also a demonstration of the Swiss watch industry's determination to defend itself when an established brand is threatened. Rolex sees this front-line battle as vital for the entire Swiss watch industry. Rolex has succeeded in keeping Rollei out of the German market. On 11 March 1995, the Cologne District court prohibited the advertising and sale of Rollei watches on German territory. In 1999, Rollei management bought out the company. Samsung lost a chance to revive its failed bid to take over Dutch aircraft maker Fokker when other airplane makers rejected its offer to form a consortium. The three proposed partners—Hyundai, Hanjin and Daewoo—notified the South Korean government that they would not join Samsung Aerospace Industries. Samsung bought AST (1994) in a failed attempt to break into the North American computer market. Samsung was forced to close the California-based computer maker following mass resignations of research staff and a string of losses. In 1992, American fashion entrepreneur Daymond John started the company with a hat collection that was made in the basement of his house in the Queens area of New York City. To fund the company, John had to mortgage his house for $100,000. With his friends J. Alexander Martin, Carl Brown and Keith Perrin, half of his house was turned into the first factory of FUBU, while the other half remained as the living quarters. Along with the expansion of FUBU, Samsung invested in FUBU in 1995. Samsung Securities was one of a handful of brokerages looking into Lehman Brothers Holdings. But Nomura Holdings has reportedly waved the biggest check to win its bid for Lehman Brothers Holdings' Asian operations, beating out Samsung Securities, Standard Chartered and Barclays. Ironically, after few months Samsung Securities Co., Ltd. and City of London-based N M Rothschild & Sons (more commonly known simply as Rothschild) have agreed to form a strategic alliance in investment banking business. Two parties will jointly work on cross border mergers and acquisition deals. In December 2010, Samsung Electronics bought MEDISON Co., a South Korean medical-equipment company, the first step in a long-discussed plan to diversify from consumer electronics. In July 2011, Samsung announced that it had acquired spin-transfer torque random access memory (MRAM) vendor Grandis Inc. Grandis will become a part of Samsung's R&D operations and will focus on development of next generation random-access memory. On 26 December 2011 the board of Samsung Electronics approved a plan to buy Sony's entire stake in their 2004 joint liquid crystal display (LCD) venture for 1.08 trillion won ($938.97 million). On 9 May 2012, mSpot announced that it had been acquired by Samsung Electronics with the intention of a cloud based music service. The succeeding service was Samsung Music Hub. In December 2012, Samsung announced that it had acquired the privately held storage software vendor NVELO, Inc., based in Santa Clara, California. NVELO will become part of Samsung's R&D operations, and will focus on software for intelligently managing and optimizing next-generation Samsung SSD storage subsystems for consumer and enterprise computing platforms. In January 2013, Samsung announced that it has acquired medical imaging company NeuroLogica, part of the multinational conglomerate's plans to build a leading medical technology business. Terms of the deal were not disclosed. On 14 August 2014, Samsung acquired SmartThings, a fast-growing home automation startup. The company isn't releasing the acquisition price, but TechCrunch reported a $200 million pricetag when first caught word of the deal in July 2014. On 19 August 2014, Samsung said it had acquired U.S. air conditioner distributor Quietside LLC as part of its push to strengthen its "smart home" business. A Samsung Electronics spokesman said the South Korean company acquired 100 percent of Quietside, but declined to elaborate on the price or other details. 3 November 2014, Samsung announced it had acquired Proximal Data, Inc., a San Diego, California-based pioneer of server-side caching software with I/O intelligence that work within virtualized systems. On 18 February 2015, Samsung acquired U.S.-based mobile payments firm "LoopPay" - This allows Samsung in smartphone transactions. 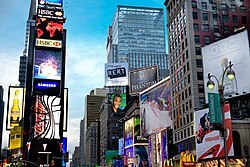 On 5 March 2015, Samsung acquired small U.S.-based manufacturer of light emitting diode displays, YESCO Electronics, which focuses on making digital billboards and message signs. On 5 October 2016, Samsung announced it had acquired Viv, a company working on artificial intelligence. On 15 November 2016, Samsung Canada announced it has acquired Rich Communications Services, a company working on a new technology for text messaging. Samsung Techwin was listed on the Korea Exchange stock-exchange (number 012450), with its principal activities being the development and manufacture of surveillance, aeronautics, optoelectronics, automations and weapons technology. It was announced to be sold to Hanwha Group in December 2014 and the take-over completed in June 2015. Samsung Thales Co., Ltd. (until 2001 known as Samsung Thomson-CSF Co., Ltd.) was a joint venture between Samsung Techwin and the France-based aerospace and defence company Thales. It was established in 1978 and is based in Seoul. Samsung's involvement was passed on to Hanwha Group as part of the Techwin transaction. Samsung Total was a 50:50 joint venture between Samsung and the France-based oil group Total S.A. (more specifically Samsung General Chemicals and Total Petrochemicals). Samsung's role was passed on to Hanwha Group when the latter acquired Samsung General Chemicals. Samsung comprises around 80 companies. It is highly diversified, with activities in areas including construction, consumer electronics, financial services, shipbuilding and medical services. In FY 2009, Samsung reported consolidated revenues of 220 trillion KRW ($172.5 billion). In FY 2010, Samsung reported consolidated revenues of 280 trillion KRW ($258 billion), and profits of 30 trillion KRW ($27.6 billion) (based upon a KRW-USD exchange rate of 1,084.5 KRW per USD, the spot rate as of 19 August 2011[update]). These amounts do not include the revenues from all of Samsung's subsidiaries based outside South Korea. As of April 2011, the Samsung Group comprised 59 unlisted companies and 19 listed companies, all of which had their primary listing on the Korea Exchange. Ace Digitech is listed on the Korea Exchange stock-exchange (number 036550). Cheil Industries is listed on the Korea Exchange stock-exchange (number 001300). Cheil Worldwide is listed on the Korea Exchange stock-exchange (number 030000). Credu is listed on the Korea Exchange stock-exchange (number 067280). Imarket Korea is listed on the Korea Exchange stock-exchange (number 122900). Samsung Card is listed on the Korea Exchange stock-exchange (number 029780). Samsung SDS is a multinational IT Service company headquartered in Seoul. It was founded in March 1985. Its principal activity is the providing IT system(ERP, IT Infrastructure, IT Consulting, IT Outsourcing, Data Center). Samsung SDS is the Korea's largest IT service company. It achieved total revenues of 6,105.9 billion won (US$5.71 billion) in 2012. Samsung C&T Corporation is listed on the Korea Exchange stock-exchange (000830). Samsung Electro-Mechanics, established in 1973 as a manufacturer of key electronic components, is headquartered in Suwon, Gyeonggi-do, South Korea. It is listed on the Korea Exchange stock-exchange (number 009150). Samsung's Silicon Valley headquarters in the North San Jose Innovation District. Samsung Electronics is a multinational electronics and information technology company headquartered in Suwon and the flagship company of the Samsung Group. Its products include air conditioners, computers, digital televisions, liquid crystal displays (including thin film transistors (TFTs) and active-matrix organic light-emitting diodes (AMOLEDs)), mobile phones, monitors, printers, refrigerators, semiconductors and telecommunications networking equipment. It is the world's largest mobile phone maker by unit sales in the first quarter of 2012, with a global market share of 25.4%. It is also the world's second-largest semiconductor maker by 2011 revenues (after Intel). Samsung Electronics is listed on the Korea Exchange stock-exchange (number 005930). Samsung Engineering is a multinational construction company headquartered in Seoul. It was founded in January 1969. Its principal activity is the construction of oil refining plants; upstream oil and gas facilities; petrochemical plants and gas plants; steel making plants; power plants; water treatment facilities; and other infrastructure. It achieved total revenues of 9,298.2 billion won (US$8.06 billion) in 2011. Samsung Engineering is listed on the Korea Exchange stock-exchange (number 02803450). Samsung Everland covers the three main sectors of Environment & Asset, Food Culture and Resort. Samsung Fine Chemicals is listed on the Korea Exchange stock-exchange (number 004000). Samsung Fire & Marine Insurance is a multinational general insurance company headquartered in Seoul. It was founded in January 1952 as Korea Anbo Fire and Marine Insurance and was renamed Samsung Fire & Marine Insurance in December 1993. Samsung Fire & Marine Insurance offers services including accident insurance, automobile insurance, casualty insurance, fire insurance, liability insurance, marine insurance, personal pensions and loans. As of March 2011 it had operations in 10 countries and 6.5 million customers. Samsung Fire & Marine Insurance had a total premium income of $11.7 billion in 2011 and total assets of $28.81 billion on 31 March 2011. It is the largest provider of general insurance in South Korea. Samsung Fire has been listed on the Korea Exchange stock-exchange since 1975 (number 000810). Samsung Heavy Industries is a shipbuilding and engineering company headquartered in Seoul. It was founded in August 1974. Its principal products are bulk carriers, container vessels, crude oil tankers, cruisers, passenger ferries, material handling equipment steel and bridge structures. It achieved total revenues of 13,358.6 billion won in 2011 and is the world's second-largest shipbuilder by revenues (after Hyundai Heavy Industries). Samsung Heavy Industries is listed on the Korea Exchange stock-exchange (number 010140). Samsung Life Insurance Co., Ltd. is a multinational life insurance company headquartered in Seoul. It was founded in March 1957 as Dongbang Life Insurance and became an affiliate of the Samsung Group in July 1963. Samsung Life's principal activity is the provision of individual life insurance and annuity products and services. As of December 2011 it had operations in seven countries, 8.08 million customers and 5,975 employees. Samsung Life had total sales of 22,717 billion won in 2011 and total assets of 161,072 billion won at 31 December 2011. It is the largest provider of life insurance in South Korea. Samsung Machine Tools of America is a national distributor of machines in the United States. Samsung GM Machine Tools is the head office of China, It is an SMEC Legal incorporated company. The Samsung Medical Center was founded on 9 November 1994, under the philosophy of "contributing to improving the nation's health through the best medical service, advanced medical research and development of outstanding medical personnel". The Samsung Medical Center consists of a hospital and a cancer center. The hospital is located in an intelligent building with floor space of more than 200,000 square meters and 20 floors above ground and 5 floors underground, housing 40 departments, 10 specialist centers, 120 special clinics and 1,306 beds. The 655-bed Cancer Center has 11 floors above ground and 8 floors underground, with floor space of over 100,000 square meters. SMC is a tertiary hospital manned by approximately 7,400 staff including over 1,200 doctors and 2,300 nurses. Since its foundation, the Samsung Medical Center has successfully incorporated and developed an advanced model with the motto of becoming a "patient-centered hospital", a new concept in Korea. Samsung SDI is listed on the Korea Exchange stock-exchange (number 006400). On 5 December 2012, the European Union's antitrust regulator fined Samsung SDI and several other major companies for fixing prices of TV cathode-ray tubes in two cartels lasting nearly a decade. SSDI also builds lithium-ion batteries for electric vehicles such as the BMW i3, and acquired Magna Steyr's battery plant near Graz in 2015. SSDI began using the "21700" cell format in August 2015. Samsung plans to convert its factory in Göd, Hungary to supply 50,000 cars per year. Samsung Securities is listed on the Korea Exchange stock-exchange (number 016360). Samtron was a subsidiary of Samsung until 1999 when it became independent. After that, it continued to make computer monitors and plasma displays until 2003, Samtron became Samsung when Samtron was a brand. In 2003 the website redirected to Samsung. 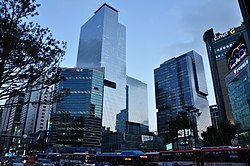 Hotel Shilla (also known as "The Shilla") opened in March 1979, following the intention of the late Lee Byung-chull, the founder of the Samsung Group. Hosting numerous state visits and international events, it has played the role of locomotive for the service industry in Korea with pride and responsibility as "the face representing the Samsung Group" and "the hotel representing Korea". Hotel Shilla maintains elegance and a tradition of winning guests' hearts with the aim of becoming "the best hospitality company". By joining LHW, it is on par with the most luxurious hotels in the world. Meanwhile, it has added modernistic design elements on top of the roof called tradition, thus going through changes to make itself a premium lifestyle space. In addition, with its know-how as a service company in the background, it started a duty-free shop business, and has built its image as the best global distribution company. Also, it is expanding its business into commissioned management of fitness facilities with five-star hotels in Korea and abroad as well as into the restaurant business. Hotel Shilla promises to be a globally prestigious hospitality company that offers the best value for money by making creative innovations and continuously taking on challenges. Shilla Hotels and Resorts is listed on the Korea Exchange stock-exchange (number 008770). S-1 was founded as Korea's first specialized security business in 1997 and has maintained its position at the top of industry with the consistent willingness to take on challenges. S1 Corporation is listed on the Korea Exchange stock-exchange (number 012750). The Samsung Hub, formerly 3 Church Street, is a skyscraper located in the Downtown Core of Singapore. State-run Korea Agro-Fisheries Trade Corp. set up the venture, aT Grain Co., in Chicago, with three other South Korean companies, Korea Agro-Fisheries owns 55 percent of aT Grain, while Samsung C&T Corp, Hanjin Transportation Co. and STX Corporation each hold 15 percent. Brooks Automation Asia Co., Ltd. is a joint venture between Brooks Automation (70%) and Samsung (30%) which was established in 1999. The venture locally manufactures and configure vacuum wafer handling platforms and 300mm Front-Opening Unified Pod (FOUP) load port modules, and designs, manufactures and configures atmospheric loading systems for flat panel displays. Company POSS – SLPC s.r.o. was founded in 2007 as a subsidiary of Samsung C & T Corporation, Samsung C & T Deutschland and the company POSCO. Samsung Air China Life Insurance is a 50:50 joint venture between Samsung Life Insurance and China National Aviation Holding. It was established in Beijing in July 2005. Samsung Biologics will be jointly owned. Samsung Electronics Co. and Samsung Everland Inc. will each own a 40 percent stake in the venture, with Samsung C&T Corp. and Durham, North Carolina-based Quintiles each holding 10 percent. It will contract-make medicines made from living cells, and Samsung Group plans to expand into producing copies of biologics including Rituxan, the leukemia and lymphoma treatment sold by Roche Holding AG and Biogen Idec Inc.
Samsung Bioepis is a joint venture between Samsung Biologics (85%) and the U.S.-based Biogen Idec (15%). In 2014, Biogen Idec agreed to commercialize future anti-TNF biosimilar products in Europe through Samsung Bioepis. Samsung BP Chemicals, based in Ulsan, is a 49:51 joint venture between Samsung and the UK-based BP, which was established in 1989 to produce and supply high-value-added chemical products. Its products are used in rechargeable batteries and liquid crystal displays. Samsung Corning Precision Glass is a joint venture between Samsung and Corning, which was established in 1973 to manufacture and market cathode ray tube glass for black and white televisions. The company's first LCD glass substrate manufacturing facility opened in Gumi, South Korea, in 1996. Samsung Sumitomo LED Materials is a Korea-based joint venture between Samsung LED Co., Ltd., an LED maker based in Suwon, Korea-based and the Japan-based Sumitomo Chemical. The JV will carry out research and development, manufacturing and sales of sapphire substrates for LEDs. SB LiMotive is a 50:50 joint company of Robert Bosch GmbH (commonly known as Bosch) and Samsung SDI founded in June 2008. The joint venture develops and manufactures lithium-ion batteries for use in hybrid-, plug-in hybrid vehicles and electric vehicles. SD Flex Co., Ltd. was founded on October 2004 as a joint venture corporation by Samsung and DuPont, one of the world's largest chemical companies. Sermatech Korea owns 51% of its stock, while Samsung owns the remaining 49%. The U.S. firm Sermatech International, for a business specializing in aircraft construction processes such as special welding and brazing. Siam Samsung Life Insurance: Samsung Life Insurance holds a 37% stake while the Saha Group also has a 37.5% stake in the joint venture, with the remaining 25% owned by Thanachart Bank. Siltronic Samsung Wafer Pte. Ltd, the joint venture by Samsung and wholly owned Wacker Chemie subsidiary Siltronic, was officially opened in Singapore in June 2008. SMP Ltd. is a joint venture between Samsung Fine Chemicals and MEMC. MEMC Electronic Materials Inc. and an affiliate of Korean conglomerate Samsung are forming a joint venture to build a polysilicon plant. Steco is the joint venture established between Samsung Electronics and Japan's Toray Industries in 1995. Stemco is a joint venture established between Samsung Electro-Mechanics and Toray Industries in 1995. Toshiba Samsung Storage Technology Corporation (TSST) is joint venture between Samsung Electronics and Toshiba of Japan which specialises in optical disc drive manufacturing. TSST was formed in 2004, and Toshiba owns 51% of its stock, while Samsung owns the remaining 49%. In 1998, Samsung created a U.S. joint venture with Compaq—called Alpha Processor Inc. (API)--to help it enter the high-end processor market. The venture was also aimed at expanding Samsung's non-memory chip business by fabricating Alpha processors. At the time, Samsung and Compaq invested $500 million in Alpha Processor. GE Samsung Lighting was a joint venture between Samsung and the GE Lighting subsidiary of General Electric. The venture was established in 1998 and was broken up in 2009. Global Steel Exchange was a joint venture formed in 2000 between Samsung, the U.S.-based Cargill, the Switzerland-based Duferco Group, and the Luxembourg-based Tradearbed (now part of the ArcelorMittal), to handle their online buying and selling of steel. S-LCD Corporation was a joint venture between Samsung Electronics (50% plus one share) and the Japan-based Sony Corporation (50% minus one share) which was established in April 2004. On 26 December 2011, Samsung Electronics announced that it would acquire all of Sony's shares in the venture. Samsung Heavy Industries owns 10% of the Brazilian shipbuilder Atlântico Sul, whose Atlântico Sul Shipyard is the largest shipyard in South America. The Joao Candido, Brazil's largest ship, was built by Atlântico Sul with technology licensed by Samsung Heavy Industries. The companies have a technical assistance agreement through which industrial design, vessel engineering and other know-how is being transferred to Atlântico Sul. Samsung Life Insurance currently holds a 7.4% stake in the South Korean banking company DGB Financial Group, making it the largest shareholder. Samsung acquired 7.4% of Gorilla Glass maker Corning, signing a long-term supply deal. Samsung Heavy Industries currently holds a 14.1% stake in Doosan Engine, making it the second-largest shareholder. Samsung Techwin currently holds a 10% stake in Korea Aerospace Industries (KAI). Other major shareholders include the state-owned Korea Finance Corporation (26.75%), Hyundai Motor (10%) and Doosan (10%). MEMC's joint venture with Samsung Electronics Company, Ltd. In 1990, MEMC entered into a joint venture agreement to construct a silicon plant in Korea. Samsung buys 10% stake in rival phone maker Pantech. Samsung currently owns 4.19% of Rambus Incorporated. Samsung currently owns 19.9% of the automobile manufacturer Renault Samsung Motors. Samsung currently owns 9.6% of Seagate Technology, making it the second-largest shareholder. Under a shareholder agreement, Samsung has the right to nominate an executive to Seagate's Board of Directors. Samsung owns 3% of Sharp Corporation, a rival company. Samsung Engineering holds a 10% stake in Sungjin Geotec, an offshore oil drilling company that is a subsidiary of POSCO. Taylor Energy is an independent American oil company that drills in the Gulf of Mexico based in New Orleans, Louisiana. Samsung Oil & Gas USA Corp., subsidiaries of Samsung, currently owns 20% of Taylor Energy. Samsung owns 5% of Wacom. The world's largest oil and gas project, Sakhalin II- Lunskoye platform under construction. 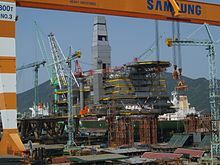 The topside facilities of the LUN-A (Lunskoye) and PA-B (Piltun Astokhskoye) platforms are being built at the Samsung Heavy Industry shipyard in South Korea. Samsung Heavy Industries will be the sole provider of liquefied natural gas (LNG) storage facilities worth up to US$50 billion to Royal Dutch Shell for the next 15 years. Shell unveiled plans to build the world's first floating liquefied natural gas (FLNG) platform. In October 2012 at Samsung Heavy Industries' shipyard on Geoje Island in South Korea work started on a "ship" that, when finished and fully loaded, will weigh 600,000 tonnes, the world's biggest "ship". That is six times larger than the largest U.S. aircraft carrier. A consortium of South Korean firms, including Samsung, Korea Electric Power Corporation and Hyundai, won a deal worth $40 billion to build nuclear power plants in the United Arab Emirates. The government of the Canadian province of Ontario signed off one of the world's largest renewable energy projects, signing a deal worth $6.6 billion for an additional 2,500 MW of new wind and solar energy. Under the agreement, a consortium led by Samsung and the Korea Electric Power Corporation will manage the development of 2,000 MW-worth of new wind farms and 500 MW of solar capacity, while also building a manufacturing supply chain in the province. 1993-2013, though still used by other Samsung companies than its electronics segment. Samsung's wordmark and current corporate logo. The basic color in the logo is blue, which Samsung has employed for years, supposedly symbolizing stability, reliability and corporate social responsibility. Samsung has an audio logo, which consists of the notes E♭, A♭, D♭, E♭; after the initial E♭ tone it is up a perfect fourth to A♭, down a perfect fifth to D♭, then up a major second to return to the initial E♭ tone. The audio logo was produced by Musikvergnuegen and written by Walter Werzowa. In July 2016, Samsung unveiled its SamsungOne font, a typeface that hopes to give a consistent and universal visual identity to the wide range of Samsung products. SamsungOne was designed to be used across Samsung's diverse device portfolio, with a focus on legibility for everything from smaller devices like smartphones to larger connected TVs or refrigerators, as well as Samsung marketing and advertisements. The font family supports 400 different languages through over 25,000 characters. Samsung donates around US$100 million per annum to the Samsung Medical Center, a non-profit healthcare provider founded by the group in 1994. Samsung Medical Center incorporates Samsung Seoul Hospital, Kangbook Samsung Hospital, Samsung Changwon Hospital, Samsung Cancer Center and Samsung Life Sciences Research Center. The Samsung Cancer Center, located in Seoul, is the largest cancer center in Asia. Samsung Medical Center and pharmaceutical multinational Pfizer have agreed to collaborate on research to identify the genomic mechanisms responsible for clinical outcomes in hepatocellular carcinoma. Samsung Electronics spent an estimated $14 billion (U.S.) on advertising and marketing in 2013. At 5.4% of annual revenue, this is a larger proportion than any of the world's top-20 companies by sales (Apple spent 0.6% and General Motors spent 3.5%). Samsung became the world's biggest advertiser in 2012, spending $4.3 billion, compared to Apple's $1 billion. Samsung's global brand value of $39.6 billion is less than half that of Apple. In 2007, former Samsung chief lawyer Kim Yong Chul claimed that he was involved in bribing and fabricating evidence on behalf of the group's chairman Lee Kun-hee and the company. Kim said that Samsung lawyers trained executives to serve as scapegoats in a "fabricated scenario" to protect Lee, even though those executives were not involved. Kim also told the media that he was "sidelined" by Samsung after he refused to pay a $3.3 million bribe to the U.S. Federal District Court judge presiding over a case where two of their executives were found guilty on charges related to memory chip price fixing. Kim revealed that the company had raised a large amount of secret funds through bank accounts illegally opened under the names of up to 1,000 Samsung executives—under his own name, four accounts were opened to manage 5 billion won. "You can even say the Samsung chairman is more powerful than the President of South Korea. [South] Korean people have come to think of Samsung as invincible and above the law", said Woo Suk-hoon, host of a popular economics podcast in a Washington Post article headlined "In South Korea, the Republic of Samsung", published on 9 December 2012. Critics claimed that Samsung knocked out smaller businesses, limiting choices for South Korean consumers, and sometimes colluded with fellow giants to fix prices while bullying those who investigate. Lee Jung-hee, a South Korean presidential candidate, said in a debate, "Samsung has the government in its hands. Samsung manages the legal world, the press, the academics and bureaucracy". The Fair Trade Commission of Taiwan is investigating Samsung and its local Taiwanese advertising agency for false advertising. The case was commenced after the Commission received complaints stating that the agency hired students to attack competitors of Samsung Electronics in online forums. Samsung Taiwan made an announcement on its Facebook page in which it stated that it had not interfered with any evaluation report and had stopped online marketing campaigns that constituted posting or responding to content in online forums. Samsung was the subject of several complaints about child labor in its supply chain from 2012 to 2015. In July 2014, Samsung cut its contract with Shinyang Electronics after it received a complaint about the company violating child labor laws. Samsung says that its investigation turned up evidence of Shinyang using underage workers and that it severed relations immediately per its "zero tolerance" policy for child labor violations. One of Samsung's Chinese supplier factories, HEG, was criticized for using underage workers by China Labor Watch (CLW) in July 2014. HEG denied the charges and has sued China Labor Watch. CLW issued a statement in August 2014 claiming that HEG employed over ten children under the age of 16 at a factory in Huizhou, Guangdong. The group said the youngest child identified was 14 years old. Samsung said that it conducted an onsite investigation of the production line that included one-on-one interviews but found no evidence of child labor being used. CLW responded that HEG had already dismissed the workers described in its statement before Samsung's investigators arrived. CLW also claimed that HEG violated overtime rules for adult workers. CLW said a female college student was only paid her standard wage despite working four hours of overtime per day even though Chinese law requires ovetime pay at 1.5 to 2.0 times standard wages. On 19 October 2011, Samsung companies was fined €145,727,000 for being part of a price cartel of ten companies for DRAMs which lasted from 1 July 1998 to 15 June 2002. The companies received, like most of the other members of the cartel, a 10-% reduction for acknowledging the facts to investigators. Samsung had to pay 90% of their share of the settlement, but Micron avoided payment as a result of having initially revealed the case to investigators. In Canada, during 1999, some DRAM micro chip manufacturers conspired to price fix, among the accused included Samsung. The price fix was investigated in 2002. A recession started to occur that year, and the price fix ended; however, in 2014, the Canadian government reopened the case and investigated silently. Sufficient evidence was found and presented to Samsung and two other manufacturers during a class action lawsuit hearing. The companies agreed upon a $120 million agreement, with $40 million as a fine, and $80 Million to be paid back to Canadians who purchased a computer, printer, MP3 player, gaming console or camera from April 1999 to June 2002. ^ a b c "삼성계열사 전자 - 삼성그룹 홈페이지". Archived from the original on 20 September 2016. ^ "Home and Kitchen Appliance showcase - Samsung". ^ a b c d "Samsung Financial Highlights". Samsung Group. Retrieved 23 March 2019. ^ "Fast Facts - Samsung Global Newsroom". Samsung. Retrieved 23 March 2019. ^ "Samsung Electronics Rises to No. 6 in Interbrand's Best Global Brands 2017". news.samsung.com. ^ "Samsung topples Intel to become the world's largest chipmaker – TechCrunch". techcrunch.com. ^ Mu-Hyun, Cho. "Samsung's logic chip biz turns to AI chips and 5G for change of fortune | ZDNet". ZDNet. ^ Park, Kyunghee (28 July 2009). "July 29 (Bloomberg) – Samsung Heavy Shares Gain on Shell's Platform Orders (Update1)". Bloomberg. Archived from the original on 24 September 2011. Retrieved 11 November 2010. ^ "The Top 225 International Contractors 2013". Enr.construction.com. Retrieved 25 August 2013. ^ "Global 500 2009: Industry: - FORTUNE on CNNMoney.com". Money.cnn.com. 20 July 2009. Retrieved 4 September 2010. ^ Valhouli, Christina (21 March 2002). "The World's Best Amusement Parks". Forbes.com. Retrieved 11 September 2010. ^ "Cheil Worldwide Inc (030000:Korea SE)". businessweek.com. Archived from the original on 5 October 2012. Retrieved 16 September 2010. ^ "Cheil Worldwide (030000 KS)" (PDF). kdbdw.com. 26 April 2010. Retrieved 8 May 2013. ^ "Samsung and its attractions – Asia's new model company". The Economist. 1 October 2011. Retrieved 11 January 2012. ^ "South Korea's economy – What do you do when you reach the top?". The Economist. 12 November 2011. Retrieved 11 January 2012. ^ Hutson, Graham; Richards, Jonathan (17 April 2008). "Samsung chairman charged with tax evasion – Times Online". The Times. London. Retrieved 28 February 2011. ^ "한국 10대 그룹 이름과 로고의 의미". www.koreadaily.com. 10 July 2006. Retrieved 19 September 2010. ^ a b "History – Corporate Profile – About Samsung – Samsung". Samsung Group. Samsung Group. Archived from the original on 15 April 2011. Retrieved 21 October 2015. ^ "Industrial giant's roots tied to nylon products". Joongangdaily.joins.com. 9 November 2009. Retrieved 5 February 2011. ^ "효성 40년史..오너 일가 뒷얘기 '눈길'". www.chosun.com. 19 June 2007. Archived from the original on 1 May 2011. Retrieved 5 February 2011. ^ "SPC-1000". old-computers.com. Retrieved 19 March 2012. ^ "Samsung to celebrate 100th anniversary of late founder". koreaherald.com. 29 March 2010. Retrieved 21 January 2011. ^ "Dubai skyscraper symbol of S. Korea's global heights". CNN. 19 October 2009. Retrieved 19 October 2009. ^ Cho, Kevin (24 April 2009). "Samsung Says Hopes of Recovery Are 'Premature' as Profit Falls". Bloomberg. Archived from the original on 26 August 2012. Retrieved 4 September 2010. ^ "Samsung buys Sony's entire stake in LCD joint venture". bbc.co.uk. 26 December 2011. ^ "Samsung Techwin to spin off camera business". reuters.com. 6 November 2008. Retrieved 5 April 2011. ^ "Samsung overtakes Nokia in mobile phone shipments". BBC News. 27 April 2012. Retrieved 6 August 2012. ^ "Samsung overtakes Nokia for Cellphone Lead". Retrieved 29 April 2012. ^ Vascellaro, Jessica E.. (25 August 2012) The Wall Street Journal. Online.wsj.com. Retrieved 19 March 2013. ^ "Samsung bites back after Apple victory". Al Jazeera English. 26 August 2012. Retrieved 19 March 2013. ^ Samsung Shares Fall After Apple Wins $1 Billion Verdict. Bloomberg. Retrieved 19 March 2013. ^ "Apple Seeks Ban on Sales of Eight Samsung Phones in U.S." Bloomberg. 27 August 2012. Retrieved 19 March 2013. ^ "Apple Denied Motion for Permanent Injunction". Scribd.com. Retrieved 19 March 2013. ^ Tood Bishop, GeekWire. "New stats: Samsung surges past IBM to lead U.S. patent race for 2015." 15 December 2015. 15 December 2015. ^ Best, Shivali (18 July 2016). "Say hello to Galaxy Note 7: Samsung reveals new smartphone will be unveiled on August 2nd". Daily Mail Online. DMG Media Limited. Retrieved 13 January 2018. ^ Hern, Alex (11 October 2016). "Samsung Galaxy Note 7 production permanently ended following battery explosions". The Guardian. Retrieved 9 August 2018. ^ "Samsung Will Ask All Global Partners to Stop Sales and Exchanges of Galaxy Note7 While Further Investigation Takes Place". news.samsung.com. Retrieved 9 August 2018. ^ "Samsung scraps Galaxy Note 7 production". BBC News. 11 October 2016. Retrieved 9 August 2018. ^ "Samsung buys Swedish wireless chip company Nanoradio". computerworld.com. June 2012. Retrieved 11 June 2012. ^ "Voigtländer & Rollei non-camera items". 9 June 1997. Archived from the original on 21 August 2011. Retrieved 5 February 2011. ^ "Basel 96 Watches Take Back the Spotlight". jckonline.com. June 1996. Archived from the original on 5 February 2011. Retrieved 5 February 2011. ^ "Franke & Heidecke - Rollei TLRs". ^ "Samsung Loses Attempt to Acquire Fokker". latimes.com. 1 January 1997. Retrieved 5 February 2011. ^ "Samsung buys Dutch group in return to M&A". 9 June 1997. Retrieved 5 February 2011. ^ "FUBU Shoes". shoeshowcase.net. Archived from the original on 24 December 2010. Retrieved 5 February 2011. ^ "Nomura Wins The Lehman Asia Stakes". Forbes. 22 September 2008. Retrieved 7 February 2011. ^ "Samsung-Rothschild alliance". koreatimes.co.kr. 5 November 2008. Retrieved 7 February 2011. ^ Ramstad, Evan (14 December 2010). "Samsung Electronics Buys Ultrasound-Monitor Maker Medison - WSJ.com". The Wall Street Journal. Retrieved 11 February 2013. ^ Dylan McGrath, EE Times. "Samsung buys MRAM developer Grandis." 2 August 2011. Retrieved 2 August 2011. ^ Chris Preimesberger, eWeek. "Samsung Acquires New-Gen Memory Maker Grandis." 2 August 2011. Retrieved 2 August 2011. ^ "Samsung to buy Sony half of LCD venture". 26 December 2011. ^ Samsung Electronics Acquires Mspot| Mspot. Mspotcorporate.com (9 May 2012). Retrieved 19 March 2013. ^ Samsung Buys Medical Imaging Company NeuroLogica. TechCrunch (28 January 2013). Retrieved 19 March 2013. ^ Samsung Acquires SmartThings, A Fast-Growing Home Automation Startup. Forbes (14 August 2014). Retrieved 19 August 2014. ^ Samsung buys U.S. air conditioner firm Quietside in 'smart home' push Archived 6 April 2015 at the Wayback Machine. Foxbusiness (19 August 2014). Retrieved 19 August 2014. ^ "Samsung Electronics Acquires Proximal Data" (Press release). Samsung. 3 November 2014. Archived from the original on 5 February 2016. ^ Stein, Scott (19 February 2015). "Samsung's LoopPay: What it is, and why you should care". CNET News. CBS Interactive Inc. Retrieved 13 January 2018. ^ By Min-Jeong Lee, The Wall Street Journal. "Samsung's Latest Acquisition: Utah-Based Yesco Electronics." 5 March 2015. 27 March 2015. ^ Panzarino, Matthew (5 October 2016). "Samsung acquires Viv, a next-gen AI assistant built by the creators of Apple's Siri". TechCrunch. Retrieved 10 October 2016. ^ Tibken, Shara (15 November 2016). "Samsung's new acquisition will make your texts more interesting". CNET News. CBS Interactive Inc. Retrieved 17 November 2016. ^ "Samsung refocuses on its core business as it sells security arm Samsung Techwin to Hanwha Group". ^ a b c "(LEAD) Hanwha wraps up takeover of four Samsung arms". 28 June 2015. ^ "Company Overview of Samsung Thales Co., Ltd". bloomberg.com. Retrieved 21 October 2015. ^ a b Miyoung Kim (17 January 2012). "Samsung Group plans record $41 billion investment in 2012". Reuters. Retrieved 18 July 2013. ^ "삼성 8년전 타임캡슐 열어보니...지난해 매출 정확히 맞춰". news.naver.com. 13 January 2011. Retrieved 22 August 2011. ^ "한국경제 大计 기업이 이끈다 지난해 주요그룹 매출 보니". Hankook Ilbo. 30 July 2010. Archived from the original on 28 April 2011. Retrieved 4 September 2010. ^ Kim Kyung-rok　(11 April 2011). "Chaebol asset holdings swell under Lee administration". hani.co.kr. Retrieved 18 September 2011. ^ "Samsung's Cheil Industries submits plans for roughly $1.4 billion IPO" (Press release). Reuters. 14 October 2014. ^ "Samsung Electro-Mechanics Co – Profile". Bloomberg Businessweek. Archived from the original on 5 September 2011. Retrieved 26 August 2012. ^ Barkham, Patrick (9 August 2012). 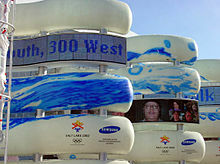 "Samsung: Olympic smartphone firm aims for big global wins". The Guardian. London: Guardian News and Media Limited. Retrieved 27 August 2012. ^ "Profile: Samsung Electronics Co Ltd". Reuters. Retrieved 27 August 2012. ^ "Samsung overtakes Nokia in mobile phone shipments". BBC News. 27 April 2012. Retrieved 27 August 2012. 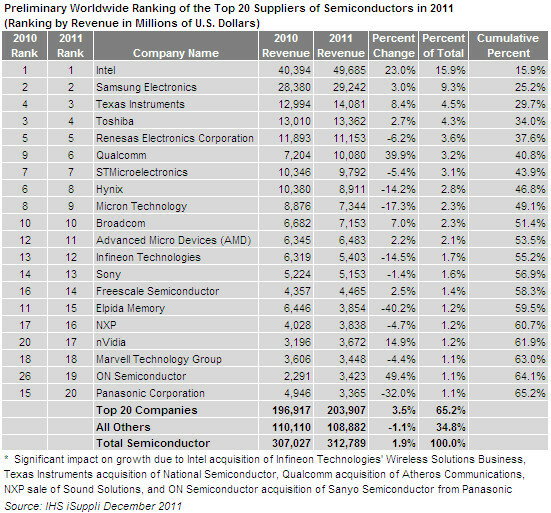 ^ "Preliminary Worldwide Ranking of the Top 20 Suppliers of Semiconductors in 2011". IHS Isuppli. Archived from the original on 27 June 2012. Retrieved 27 August 2012. ^ "Samsung Engineering Co Ltd (028050.KS)". REUTERS. Retrieved 22 February 2017. ^ "2011 Financial Statements" (PDF). Samsung Engineering. Archived from the original (PDF) on 5 June 2013. Retrieved 27 August 2012. ^ "Profile: Samsung Fire & Marine Insurance Co Ltd". Reuters. Retrieved 18 October 2012. ^ "Corporate Profile". Samsung Fire & Marine Insurance. Retrieved 18 October 2012. ^ a b "Annual Report 2010". Samsung Fire & Marine Insurance. Archived from the original on 1 February 2013. Retrieved 18 October 2012. ^ "Company Profile for Samsung Heavy Industries Co Ltd". Bloomberg. Retrieved 27 August 2012. ^ "Separate Statements of Income Years Ended December 31, 2011 and 2010" (PDF). Samsung Heavy Industries. Retrieved 27 August 2012. ^ "From bad to worse". The Korea Times. 19 August 2012. Retrieved 27 August 2012. ^ a b c "2011 Annual Report" (PDF). Samsung Life Insurance. Archived from the original (PDF) on 4 October 2012. Retrieved 28 August 2012. ^ "Company Profile for Samsung Life Insurance Co Ltd". Bloomberg. Retrieved 28 August 2012. ^ "Samsung SDI to acquire Magna International's battery pack business". www.samsungsdi.com (in Korean). Retrieved 20 September 2018. ^ "Samsung SDI Unveils E-bike Battery Capable of 100km on Single Charge". Be Korea-savvy. 26 August 2015. Archived from the original on 26 December 2015. Retrieved 31 August 2016. ^ "Samsung SDI to Build Electric Vehicle Battery Plant for European Market". TheStreet. 30 August 2016. Retrieved 30 August 2016. ^ "South Korea Starts Grain Venture in Chicago to Secure Supply". bloomberg.com. Retrieved 19 March 2012. ^ "Brooks Automation and Samsung Electronics Announce a Joint Venture". Investors - Brooks Automation, Inc. Brooks Automation, Inc. Retrieved 28 March 2012. ^ "POSCO and Subsidiaries" (PDF). London Stock Exchange. London Stock Exchange plc. 31 December 2008. Retrieved 6 June 2012. ^ Hu Yuanyuan (7 July 2005). "Insurance joint venture off to flying start". 英语频道-搜狐网站. Beijing Sohu New Media Information Technology Co. Ltd. Retrieved 19 March 2012. ^ Yang, Jun (25 February 2011). "Samsung Group, Quintiles Plan $266 Million Venture to Make Biologic Drugs". Bloomberg News. Retrieved 13 January 2018. ^ "Biogen Idec (NASDAQ:BIIB) and Samsung JV". livetradingnews.com. Archived from the original on 15 June 2012. ^ "Biogen Idec and Samsung Bioepis Ink Biosimilar Deal". Gen. Eng. Biotechnol. News. 34 (2). 15 January 2014. p. 14. ^ "Samsung to sell chemicals and defence operations for $1.7bn". Kable. 26 November 2014. Retrieved 6 March 2014. ^ "Samsung BP Chemicals". BP. Archived from the original on 3 April 2015. Retrieved 6 March 2015. ^ "Company Overview of Samsung BP Chemicals Co., Ltd". Bloomberg Business. Bloomberg. Retrieved 6 March 2015. ^ "Samsung and Sumitomo Chemical to make sapphire substrates for LEDs". ledsmagazine.com. Retrieved 19 March 2012. ^ "company/introduce". sdflex.com. Archived from the original on 22 September 2013. Retrieved 19 March 2012. ^ "Samsung Aerospace, Sermatech Launch Korean JV". english.chosun.com. Retrieved 28 March 2012. ^ "Siam Samsung Life ready to reawaken". bangkokpost.com. Retrieved 19 March 2012. ^ "Siltronic-Samsung Joint Venture". wacker.com. Archived from the original on 5 October 2012. Retrieved 19 March 2012. ^ "Completion Ceremony for EDS Production". toray.com. Archived from the original on 30 November 2012. Retrieved 28 March 2012. ^ "Toray/Samsung JV boosts FPD circuit substrate capacity". electroiq.com. Retrieved 28 March 2012. ^ "Alpha's demise thwarts Samsung's processor dreams, analysts say". www.eetimes.com. Retrieved 2 April 2012. ^ "LED EXPO&OLED EXPO 2011 An Interview with GE Lighting". us.GFSSGYG aving.net. Retrieved 2 April 2012. ^ "Steel firms in B2B venture". money.cnn.com. 10 May 2000. Retrieved 2 April 2012. ^ "Shipyards in Brazil – Rev. D, June 2010" (PDF). INTSOK. Archived from the original (PDF) on 2 February 2014. ^ "Milestone launch at Brazil's Atlântico Sul". MarineLog. Retrieved 6 March 2012. ^ "Company Analysis" (PDF). rdata.youfirst.co.kr. Archived from the original (PDF) on 11 April 2014. Retrieved 19 March 2012. ^ Reisinger, Don (23 October 2013). "Samsung eyes 7.4 percent stake in Gorilla Glass maker Corning". CNET News. CBS Interactive Inc. Retrieved 13 January 2018. ^ "Doosan Engine ends 33.2 pct higher on stock market debut". yonhapnews.co.kr. 3 January 2011. Retrieved 19 March 2012. ^ "Korea Aerospace sale could prove need for clearer M&A guidelines". privateequitykorea.com. Retrieved 19 March 2012. ^ "MEMC Korea Company". memc.com. Retrieved 19 March 2012. ^ "Rambus, Inc. RMBS". morningstar.ca. Retrieved 6 March 2012. ^ "Seagate to Buy Samsung's Hard-Disk Unit for $1.38 Billion, Build Alliance". Bloomberg Businessweek. Retrieved 6 March 2012. ^ "Samsung buys stake in struggling Sharp". money.cnn.com. Retrieved 23 October 2013. ^ "Taylor Energy Sells Gulf of Mexico Assets to Two South Korean Companies". reuters.com. 1 February 2008. Archived from the original on 26 July 2012. Retrieved 19 March 2012. ^ "The Russian offshore project "Sakhalin II" is relying on Arma-Chek R". armacell.com. Archived from the original on 1 May 2011. Retrieved 7 February 2011. ^ "Samsung Heavy Industries". www.forbes.com. 23 September 2009. Retrieved 13 September 2010. ^ "Major construction begins on the Prelude FLNG project". 18 October 2012. Retrieved 15 July 2014. ^ "The gas platform that will be the world's biggest 'ship'". bbc.co.uk. 15 July 2011. Retrieved 19 March 2012. ^ "Seoul wins 40-billion-dollar UAE nuclear power deal". www.france24.com. 28 December 2009. Archived from the original on 3 March 2011. Retrieved 29 September 2010. ^ "Korean Companies Anchor Ontario's Green Economy – January 21, 2010". www.premier.gov.on.ca. 21 January 2010. Archived from the original on 15 May 2011. Retrieved 13 September 2010. ^ "한국 10대 그룹 이름과 로고의 의미". The Korea Daily. JMnet USA. 7 June 2010. Retrieved 13 January 2018. ^ "Speaker". Audio Branding Academy. Retrieved 17 December 2015. ^ "Logo Video". Samsung-Youtube. Retrieved 15 January 2011. ^ Chaim Gartenberg, The Verge. "Samsung developed its own font called SamsungOne." 25 July 2016. 25 July 2016. ^ "기업의 사회공헌 삼성그룹, 함께 가는 '창조 경영'... 봉사도 1등". www.dt.co.kr. Retrieved 19 September 2010. ^ Roberts, Rob (26 October 2009). "AECOM Technology buys Ellerbe Becket". kansascity.bizjournals.com. Retrieved 19 September 2010. ^ Kim, Miyoung (27 November 2013). "Samsung's marketing splurge doesn't always bring bang-for-buck". Reuters. Retrieved 21 October 2015. ^ Choe Sang-Hun (6 November 2007). "Corruption scandal snowballs at South Korea's Samsung Group". New York Times. Retrieved 23 September 2013. ^ Chico Harlan (9 December 2012). "In South Korea, the Republic of Samsung". The Washington Post. Archived from the original on 21 September 2013. Retrieved 23 September 2013. ^ AFP (15 April 2013). "Taiwan probes Samsung 'dirty tricks' vs HTC'". Google News. Archived from the original on 28 July 2013. Retrieved 27 September 2013. ^ CNA (9 April 2013). "Samsung postpones Galaxy 4S debut in Taiwan". Want China Times. Archived from the original on 27 September 2013. Retrieved 27 September 2013. ^ a b c Reisinger, Don (28 August 2014). "Samsung supplier factory found to use child labor, watchdog says". CNET. United States. Retrieved 10 March 2015. ^ "Another Samsung supplier factory exploiting child labor". www.chinalaborwatch.org. Retrieved 20 September 2018. ^ "Cover-up involving underage workers at Samsung supplier alleged by labor group". PCWorld. Retrieved 20 September 2018. ^ "Antitrust: Commission fines DRAM producers € 331 million for price cartel; reaches first settlement in a cartel case". European Commission. European Commission. Retrieved 22 April 2012. ^ "Canadian DRAM Class Action". themoneyismine.com. Retrieved 31 August 2015. Wikimedia Commons has media related to Samsung.